The iS Clinical Poly-Vitamin Serum is a gentle skin formula filled with powerful ingredients to bring radiance to all skin types, even sensitive skin. Using three key ingredients, Vitamins B3 and B5, hyaluronic acid, and sugar cane, this serum packs in a combination of essential vitamins, bionutrients, and age-fighting antioxidants to deeply hydrate and significantly improve the appearance of texture and tone of your skin. iS Clinical created Poly-VItamin Serum specifically for cancer patients that were undergoing treatment to minimize radiation dermatitis. This unique formula combines olive leaf extract with Vitamin B5 to promote tissue repair to help rebuild damaged skin. Poly-Vitamin Serum is ideal for sensitive skin, post-procedure skin, and skin that has become compromised from medical treatments. In addition to promoting tissue repair, Vitamins B3 and B5 work to firm skin, reduce hyperpigmentation caused by sun damage, and improve the skin’s ability to retain moisture. Niacinamide, an extract of Vitamin B3, helps prevent sun-induced hyperpigmentation in the deeper layers of the skin from surfacing and becoming visible. By preventing the hyperpigmentation from surfacing, the skin retains an even, healthy appearance. Youthful skin has naturally occurring hyaluronic acid, nature’s most powerful hydrator, to help it retain moisture and give it a tight, smooth appearance. Through aging and sun damage, our natural production of hyaluronic acid slows. iS Clinical Poly-Vitamin Serum contains hyaluronic acid which attracts and binds up to 1,800 times its molecular weight in water, adding essential hydration to skin and plumping it up to smooth out fine lines and wrinkles. The sugar cane extract in the serum provides a natural source of glycolic acid that gently exfoliates natural buildup that causes dull skin. Exfoliating the dead skin cells away allows the serum to penetrate deeper and bring a fresh layer of skin to the surface, leaving the skin brighter and smoother. Using iS Clinical Poly-Vitamin Serum isn’t just doing amazing things for your skin; it is also supporting Breast Cancer Awareness month! 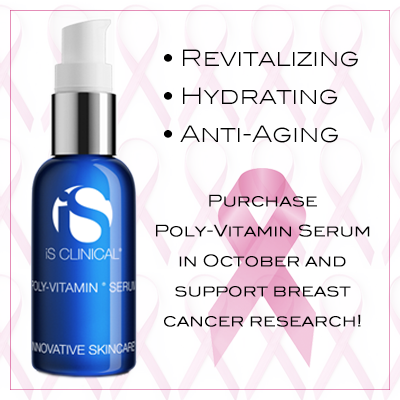 For the month of October, iS Clinical is donating 100% of the proceeds from their Poly-Vitamin Serum toward breast cancer research at the National Breast Cancer Coalition. Their commitment doesn’t stop there; iS Clinical co-founders work year round through the iS Cancer Care program to develop products, like the Poly-Vitamin Serum, and protocols which are safe and effective for patients with treatment-compromised skin. There is no better time to find out why doctors, aestheticians and beauty gurus can’t stop raving about iS Clinical Poly-Vitamin Serum. Call Dr. Shapiro’s Skin Klinic (480) 451-1700 today to get your iS Clinical Poly-Vitamin Serum and support a great cause!